to Display Announcements & Presentations. 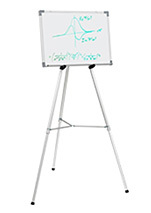 The mobile white boards make presentations and lectures easy to do. 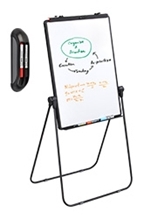 These white board stands have a number of great features that similar expensive whiteboards have without the high price tag. 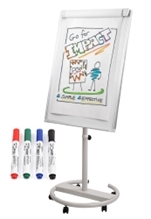 The mobile notice boards, mobile white boards combine a large writing surface area with a movable design to easily be brought to different classrooms, conference rooms, exhibition halls, and more. The white board stands are an easy purchase to make employee lives easier. 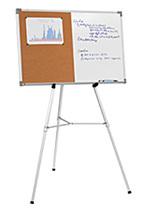 White board stands, mobile notice boards, and other mobile white boards have different sizes of boards available. These each provide an ample amount of writing space. 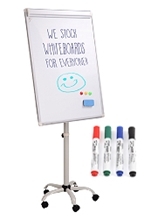 The white board stands are double-sided as well, allowing for important information to remain on the board if you need more room, as you can just switch sides! The white board stands do not have to be turned around however. A spring-loaded clip holds the frame in place, and you simply have to pull the clip down and flip the board, in one smooth, fun motion! 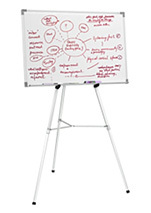 These whiteboards have locking castors on the base of the display, making movement in between rooms or areas very easy. The castors can be locked once in a desired position, stabilising the display for a sturdy unit. This lightweight display is made from aluminium for a durable display that is still able to be moved with ease. Whether moving between classrooms or conference rooms ,this is an easy to transport unit for placing in different locations! 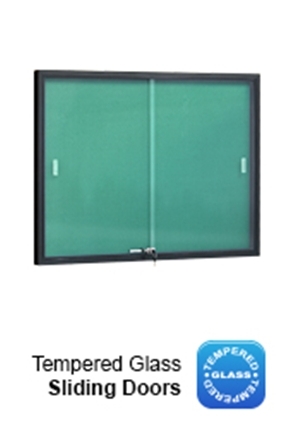 The frames of the display has plastic rounded safety corners to help prevent damage to both property and people. The dry erase board accepts normal dry erase markers, as well as magnets to offer different methods of posting information. 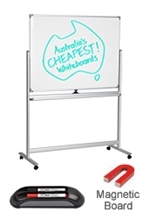 The whiteboards are made of an imported whiteboard that has gloss levels of 70% - 80% for a premium quality board. There is a tray on the board as well for placing erasers and markers for convenient access. 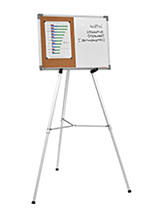 Order a whiteboard floor stand today for use at your location! There are many types of noticeboards for you to choose from aside from these freestanding models with varying features. 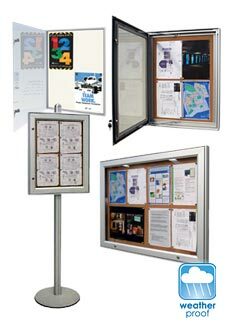 Corkboards, lockable displays, and white board displays in both stand & wall-hanging form are available to choose from. 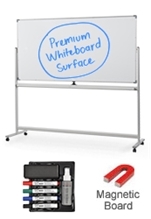 The many types of whiteboards provide a magnetic display with an erasable writing surface for versatility in displaying information. There are also displays offered that combine the whiteboard with a self-healing cork side. The different sizes of the mobile notice displays include 900 x 1200,mm 900 x 1500mm, & 900 x 1800mm to help create great presentations. The displays make movement between rooms easy with the locking castors. We offer hundreds of products in the online catalogue to outfit your business with in a variety of different ways. With standoffs, clip frames, acrylic holders, light boxes, brochure displays, iPad holders, portable counters, & lecterns, our company has a product with greats features that is sure to be beneficial to your business in some way, whether creating perfect presentations or presenting goods in an eye-catching manner. See the individual product pages for more details on each item. Slimline Warehouse has been a national leader for display products for a number of years. Our winning combination of high-quality items paired with low prices has carved our name out for businesses wishing to not waste their valuable money. We provide same day despatch on most in stock products on orders paid prior to 1pm EST. Shipping is provided Australia-wide, including Gold Coast, Perth, Darwin, Alice Springs, Sydney, Canberra, Melbourne, Cairns & Brisbane! Purchase today for your company to start relating to customers in an inexpensive, eye-catching fashion!